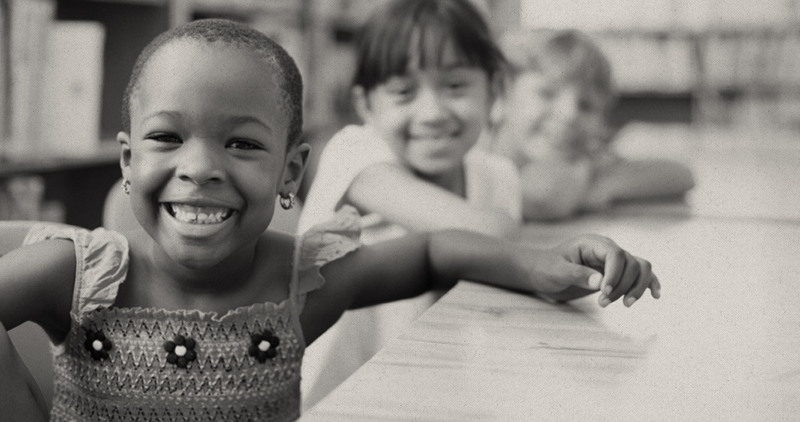 The foundation’s goal is to improve the quality of life both in and through these communities, with a particular focus on enriching the lives of children. The Calipari Foundation invests in communities. These communities are not limited by geography — they can also be educational, social, and spiritual in nature. That description would not be wrong. But neither would it be entirely right. According to John Calipari, that is. And he should know. …to give back to others. Since September 2012, a primary way Calipari has assisted people in Kentucky—and beyond—is through The Calipari Foundation (TCF), a public charity based in Lexington. The foundation’s mission is to provide for the physical, educational, leadership, and developmental needs of people and communities, while encouraging and equipping others to do the same. Calipari and his wife, Ellen, created the foundation so that they would have a local, formalized vehicle through which they could focus their giving efforts. Prior to starting TCF, the Caliparis utilized a donor advised fund housed at the Community Foundation of Greater Memphis for much of their charitable work. Calipari initiated the donor advised fund when he was the men’s basketball head coach at the University of Memphis. While coaching in Memphis, Calipari put up big numbers. But he’s put up even bigger ones in Lexington—in both basketball and philanthropy. And numbers tell a story. The Calipari Foundation’s numeric tale is one wherein, by the end of this year, more than 50 nonprofit organizations will have received more than $2.5 million in grants. A good story, right? Well, yes…but not quite good enough. 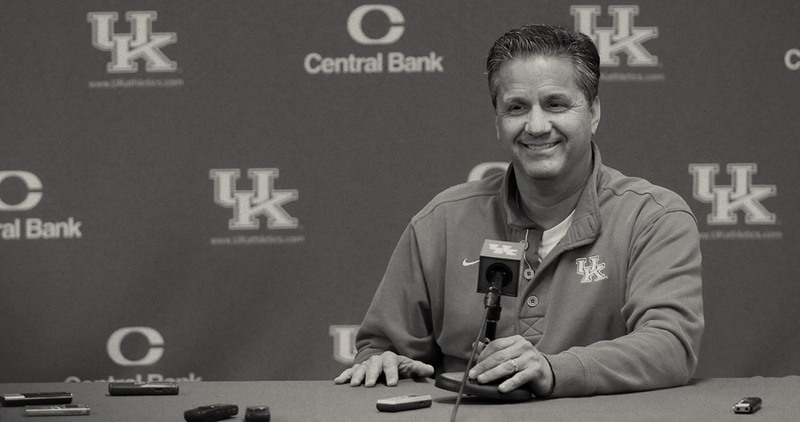 John Calipari tends not to be a complacent person. You may have heard that about him. Consequently, Calipari has used “the seat he sits in” to generate funds to match nearly all of the dollars granted by the foundation, meaning the combined economic impact of TCF’s grants and matching gifts these past four years has been approximately $5 million. Oh, and that $5 million doesn’t count the $1 million Calipari helped raise via the Hoops for Haiti telethon in 2010 or the $1 million he helped raise via the Superstorm Sandy telethon in 2012. Turns out that “spheres of influence” is not only TCF’s tag line, but also its operating approach. Ohonme cites the 2014 trip UK men’s basketball took to the Bahamas as one of his favorite moments in the relationship between TCF and Samaritan’s Feet. Serving, in this case, meant washing the feet of local children and fitting them for shoes. Along with the outreach in the Bahamas, Calipari and the foundation have supported Samaritan’s Feet in its nationwide Back to School events, along with specific efforts in Haiti and in eastern Kentucky. TCF has been busy here in central Kentucky, too. One of the foundation’s important efforts has been supporting a local chapter of Team Focus, an organization founded by Mike Gottfried and his wife, Mickey. Team Focus provides role models and mentors for young men without a father figure in their lives, aiming to help them develop as leaders. Gottfried first met Calipari at the University of Kansas in the early ‘80s. At the time, Gottfried was the Jayhawks head football coach and Calipari was an assistant basketball coach. Sort of. “I love the story of John working the KU basketball camp right out of college,” said Gottfried. “He worked 18 hours a day. At the end of the camp, Head Coach Ted Owens was so impressed with John that he offered him a volunteer coaching job—he would be able to coach, but he would also have to serve the players three meals a day. And even though the adjective preceding “Coach” in Calipari’s title has long since changed from “volunteer”, Gottfried remains impressed with Calipari’s heart to serve. And Kentucky—the residents of the Commonwealth and those fans who live beyond its borders—love him back. Which works out very well when people are in need. Calipari’s initial connection with the Bluegrass Area Chapter of the American Red Cross came via the aforementioned Hoops for Haiti telethon in 2010. The most recent manifestations of TCF’s partnership with the Red Cross were this past August’s text-to-give campaign and the Coach Cal Celebrity Softball Classic, played at Whitaker Bank Park. These initiatives, combined with Red Cross matching gifts and funds contributed by a regional Papa John’s pizza promotion, generated more than $500,000 for flood relief in Louisiana. 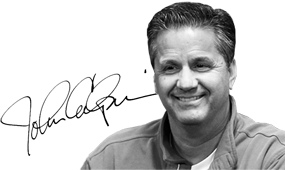 The Calipari Foundation will simply continue doing what it has been doing since its inception. This includes initiating and participating in interesting, engaging activities to raise support for worthy causes. In the past, the foundation has, among other things: hosted a comedy show; auctioned various autographed items from Calipari’s “closet,” including shoes he wore during UK games and surfboards; raffled two Harley-Davidson motorcycles (one to benefit Superstorm Sandy victims and the other to benefit the Trooper Project of the Kentucky State Police); and hosted the annual John Calipari Basketball Fantasy Experience, TCF’s most successful fundraising event, that has often included an alumni game featuring former UK men’s basketball players. Expect not only more of the same but also more from the man who currently holds the “seat” of Head Coach, Men’s Basketball, University of Kentucky. He’s completely fine with that. For he knows that Kentucky basketball fans tend not to be complacent persons, either. The Calipari Foundation Inc. is 501(c)(3) nonprofit organization, as recognized by the Internal Revenue Service. To donate to the foundation, please visit www.caliparifoundation.org/contribute.